Figure 1. Stepped horizontal and vertical settlement on front-porch foundation. New Jersey homeowner Becky R. recently detected expansive lateral and vertical cracks running across her front porch, basement walls and slab. After consulting a structural engineer for forensic advice, Becky initiated a long-term crack-monitoring project, installing Buildera CRACKMON® 5020AV crack monitors to analyze crack displacement and foundation settlement over time. Armed with important insights, Becky provided structural-engineering consultants with quantitative evidence of progressive foundation settlement, leading to a range of remediation options. Becky’s 2,700 sq-ft single-family home—built in 1973 —stands in a mature residential neighborhood in Bergen County, New Jersey, approximately 15 miles northwest of New York City . A series of narrow, steep-sided ridges with a softly rolling landscape characterize the surrounding terrain . Becky learned that her home, which she purchased in 2012, had settled about 14 years prior; the previous homeowners dug up the foundation and poured a new concrete footing. This structural history sheds light on the existing cracks propagating through the porch and basement, implicating ongoing foundation settlement from insufficient substrate compaction and adverse geotechnical conditions, such as wet and erosive soil. To identify the root cause and potential remediation options, Becky self-installed five Buildera crack monitors to analyze foundation stability and structural cracking in relation to geotechnical factors. Geotechnical reports reveal that most of the soils surrounding Becky’s home were formed in water-sorted deposits—more subject to erosion compared to unsorted deposits . A geotechnical soil report from 1995 states, “the boring indicated loose fill consisting of sand, brick, wood, and organic silt to 6’, and wood and organic silt to 10’8” . Although most of the settlement is occurring towards the front of the house, it’s important to note the presence of a small creek running near the back. According to a map of the soil composition in Bergen Country, the home rests upon gently sloping Urban Land (UR), the second most prevalent soil type in her borough, which covers approximately 20% of its land area. Highly developed and paved with impermeable materials, Urban Land leads to significantly rapid surface runoff. Erosive soil, coupled with seasonal rains and snow, are suspected contributors to foundation settlement. Figure 2. Buildera CRACKMON® 5020AV crack monitor reveals incremental lateral and vertical crack movement on porch stem wall. This differential movement is additive to the original crack width that predated the crack-monitoring program. 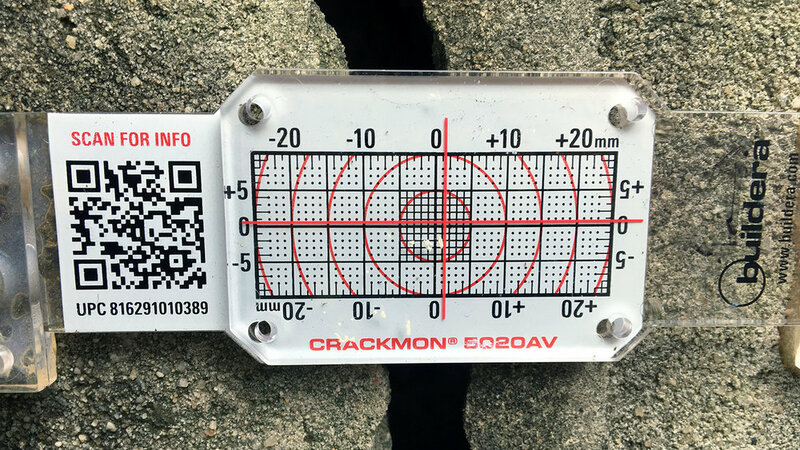 The Buildera CRACKMON 5020AV is a cost-effective crack-monitoring device that allows property owners and engineers to document crack movement over time on concrete, masonry, steel, and wood-framed structures. Unlike most crack monitors, which have a 1 mm visual resolution, the CRACKMON 5020AV allows measurement resolution as small as .025 mm (0.001”) when used in conjunction with digital calipers. Over a 12-month span, Becky gained important structural-forensic insight through the Buildera CRACKMON 5020AV crack monitors. Figure 3. Stepped cracking on interior concrete-block wall near copper-pipe/hose-bib penetration shows evidence of basement settling. Figure 4. Buildera CRACKMON 5020AV measures new lateral displacement on basement wall approaching 1 mm. Figure 5. 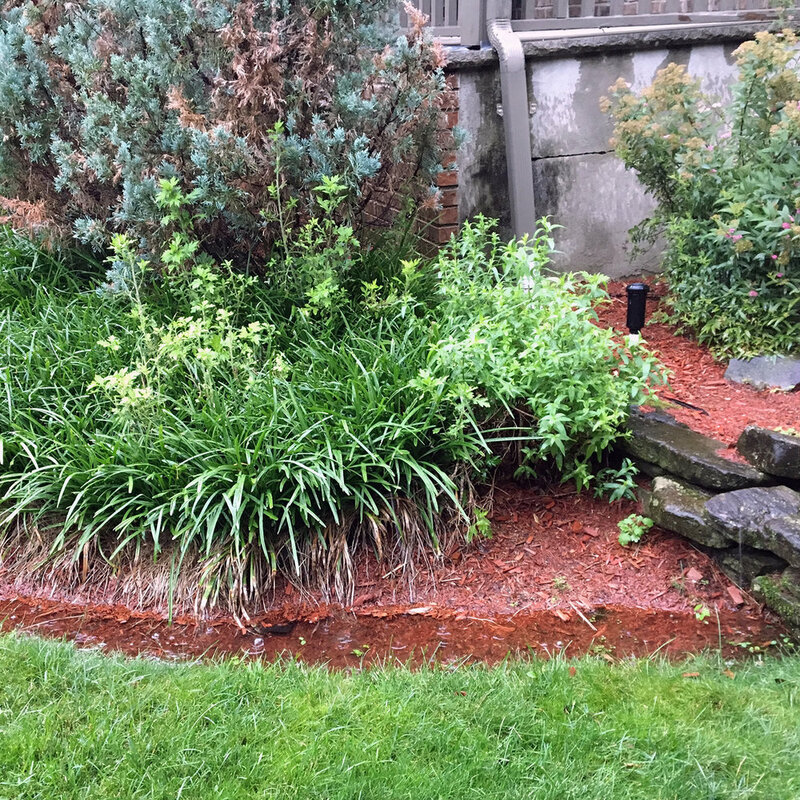 Surface runoff near downspout highlights water accumulation in the vicinity of front porch and basement. In April 2018—months after little-to-no incremental crack displacement—Becky noticed a 2 mm lateral, 1 mm vertical shift on the large porch crack—the site of two CRACKMON 5020AV monitors. She also observed approximately 1 mm of crack movement along the interior basement walls. Dynamic changes less than 1 mm are minimal and fall within the expected variation due to temperature changes from thermal expansion of concrete and the crack monitors. However, the 2 mm lateral change is more notable, indicating progressive crack expansion over time. When coupled with the baseline crack displacement in excess of 6 mm to 10 mm, this additional expansion indicates continued settlement over the course of a full year. Upon this discovery and Buildera’s recommendation, Becky contacted multiple structural engineers to compare remediation options and costs. Meanwhile, the Buildera CRACKMON 5020AV monitors continue to provide ongoing quantitive data necessary to engineer an appropriate solution for the growing structural shifts. With concrete proof of ongoing settlement, Becky plans to conduct a local soil assessment to better pinpoint the geotechnical factors causing the crack displacement. Potential remediation options include underpinning the existing foundation with stabilizing piers and improving drainage to better direct surface runoff and manage soil moisture from rain and irrigation. Buildera is grateful to Becky R. for her time, cooperation, and invaluable contributions to this case study, including photographs. A pseudonym was used for this case study to respect the homeowner’s privacy. “Environmental Resource Inventory—Bergen County, New Jersey” Hakim Associates, 19 Jan 2010. Web. Accessed 27 Jul 2018. Bergen County Soil Report. 1995. Web. Accessed 21 Aug 2018. Application story by Trevor Dalton. Photos ©2018 Becky R., reproduced with permission. ©2018 Buildera. All rights reserved.